I'm loving this word! 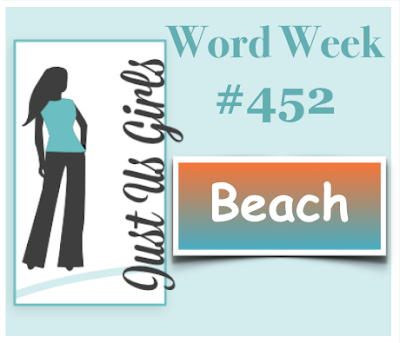 Fun times this week with beachy cards. I sponged on the background colors, and used some dies I have had forever. Added some netting and a sentiment, and this card is all done! Your turn. Come on over to Just Us Girls Challenge and play along! Can't wait to see the galley this week. Beautiful beach card! Love the dies, color and esp that netting - Perfect!!! Gorgeous beach scene and I love all the props too. Love that netting! Great Beach card! The netting adds so much interest, this is terrific! Fabulously simple. Love the sentiment - so right! Great idea with the netting. You always come up with amazing elements. So lovely! I love that BG Vicki! I love the shells on the net and all of your gorgeous sponging! Beautiful card! Fabulous beach images, Vicki! The netting...a very cool touch! How did you happen to have the perfect sentiment, Vicki? I love the netting. This is cool! Love that netting and background color! Looks fantastic!